Peter Wright has lost only one of his last five Premier League matches, and last week he defeated Simon Whitlock 7-4 to claim his fourth win of the campaign. Snakebite can’t finish any higher in the league table than his current position of seventh place, whilst a win for Simon Whitlock earlier in the evening would mean Wright starts this match down in eighth place. Last weekend at the German Darts Grand Prix, he lost 6-5 to Danny Noppert in the last 16. Wright has only made it through to the last 16 on two of his last seven ranking tournament appearances. Daryl Gurney’s chances of making the play-offs are extremely slim; he trails fourth-placed Gary Anderson by two points, but Anderson is also 12 legs better off in terms of legs difference so Gurney has to win handsomely and hope Anderson falls to a very heavy defeat against Van Gerwen. Last week in Birmingham, he drew 6-6 against Michael Smith. That was Gurney’s seventh drawn match in the 2018 Premier League. Gurney still tops the 180 hitting charts in the 2018 Premier League, with his total of six in his match against Smith taking his overall total to 63. 2017 Premier League finalist Peter Wright rounds off his underwhelming 2018 Premier League campaign with a match against Daryl Gurney who has performed very admirably in his debut Premier League season; the Northern Irishman has a very small chance of still making the play-offs but realistically his hopes are over. 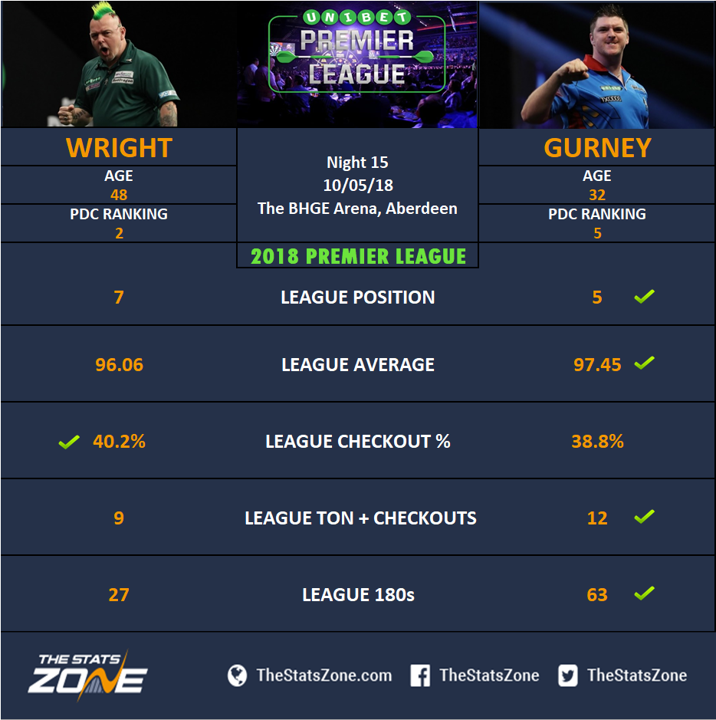 Gurney has a good recent record against Wright with four consecutive wins over Snakebite before they drew 6-6 earlier in the league season. The scoring power of Gurney coupled with some improved finishing have seen him prove to be a tough nut to crack and Wright doesn’t appear to be playing consistently enough to suggest he will come out on top. A win for Gurney is the prediction.